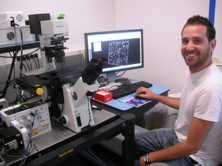 Researchers at the Andalusian Center for Developmental Biology (CABD) use light microscopy as a tool to study development of cells, organs and embryos in different model organisms. Most of the experimental systems under analysis display complex 3D organisation both at the cellular and organismal levels. Thus, access to the appropriate microscopic techniques to unveil this complexity becomes of paramount importance. Moreover, because of the properties of growing animals, it is necessary to follow their development in real time, which adds further analytical challenges. 3D and 4D (3D + time) Fluorescence Microscopy implies the acquisition of optical sections that need processing to render informative 3D reconstructions. 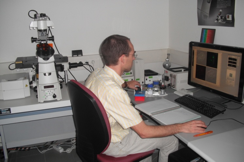 An important characteristic of traditional wide-field microscopy is that each optical section provides both in focus signal, and out of focus emission that needs to be digitally treated to improve the final quality of the image. The word deconvolution refers to the inversion of the distortion introduced with the use of an optical widefield system to acquire fluorescent images. Deconvolution algorithms are based on mathematical models of image formation to subtract or reassign out of focus signal. One of the most optimal methods is the reassignment of each out of focus photon to its original point, a technique termed image restoration. Confocal Microscopy is based on sample scanning utilising a point shaped, monochromatic laser beam, also known as a laser line. The light emitted from the specimen is focused by a very small opening, called pinhole (diaphragm) located before the photodetectors. This pinhole cuts away all out of focus information, and allows only the signal from the focal plane to pass through and thus to contribute to image formation. A grid of stripes of defined width is projected onto the focal plane of the objective and shifted laterally in three defined steps relative to the sample. A CCD camera takes a picture in each grid position. The three "raw" images are combined into a resultant image by on-line computation. The resultant image is an optical section through the sample, from which all image slices originate. Free of artifacts, with out-of-focus information removed. This image has an improved signal-to-noise ratio, and approximately doubles resolution in axial (Z) direction. 2. Confocal Microscope Leica SP2-AOBS. 3. Confocal Microscope Leica SPE. 0.3um and moderate taper lengths (10 to 15mm). Oxford: BIOS Scientific Publishers, cop. 3. Confocal microscopy: methods and protocols (1999)Totowa, N.J.
4. Imaging Living Cells (1999) Rosario Rizzuto. Cristina Fasolato. San Diego: Academic Press, cop. 8. Confocal Microscopy for Biologists (2004) Hibbs, A.R. Cold Spring Harbor (New York): Cold Spring Harbor Laboratory Press, cop. 10. Cell Imaging (2006) D. Stephens. 11. Handbook of Biological Confocal Microscopy (2006) Pawley, J. 9. Advanced Light Microscopy Facility. EMBL.